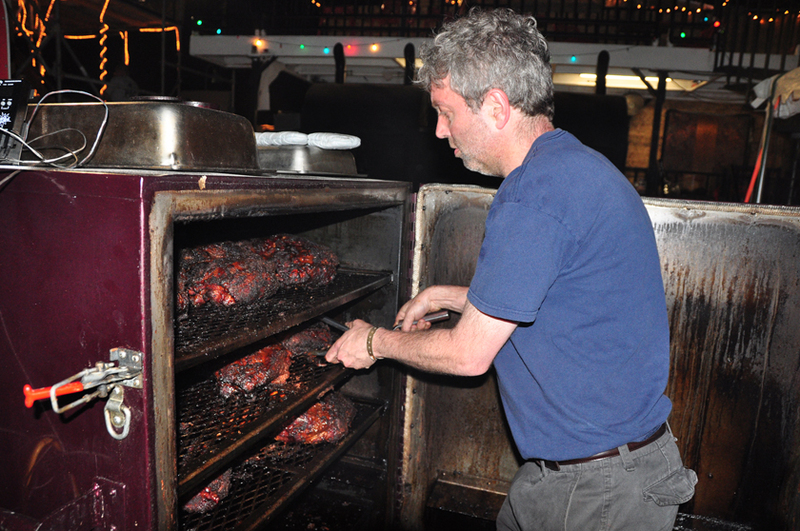 Willie Wagner has been head chef, owner, and operator of Honky Tonk Barbeque at 1213 W. 18th Street in Chicago. Honky Tonk is located in the heart of the pilsen neighborhood. Honky Tonk has been open for 4.5 years. Before the restaurant opened, Willie was cooking at fairs, festivals and parties for 3 summers. He was able to develop his recipes for barbeque over 25 years of hosting barbeque parties and often turning to the Weber kettle to cook many meals. These parties varied greatly in size. There were whole hogs for his daughters birthday parties. There were whole lambs cooked on fire escapes. There were many trips to Paulina market to cook many different barbeque meals. Over the past 5 years, Willie has participated at the World Championship Barbeque Cookoff, Memphis in May five times. In 2008, Willie was awarded 3rd place for his pork shoulder. You can enjoy the same championship barbeque in the restaurant every day. Honky Tonk features a very traditional Southern style menu with comfort food side orders. Everything is prepared fresh in-house including homemade desserts and custom barbeque sauces. There are also many vegetarian items to appeal to a wide variety of palettes.